After a wet, windy November, winter has finally arrived in Somerset. I don’t think anyone will be sad to see the back of the rain. Horses, hounds, farmers and in fact, anyone just trying to get from a-to-b have had a difficult time with flood water, soaked fields and storm damage aplenty. 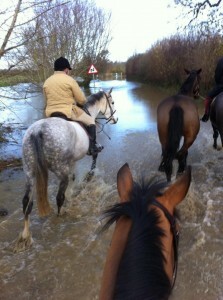 As you can see from the picture here, our normal rides have taken on rather a exciting watery feel – horses are by far the best form of transport in the floods and we’ve seen quite a few cars abandoned. Where we live, on the edge of the Somerset levels near Glastonbury, the land quickly floods and it is easy to imagine how the countryside would have looked before the monks of Glastonbury Abbey drained the farmland surrounding the Isle of Avalon. It was interesting to hear on Countryfile this week that Somerset was so called because it meant ‘Land of the Summer people’. 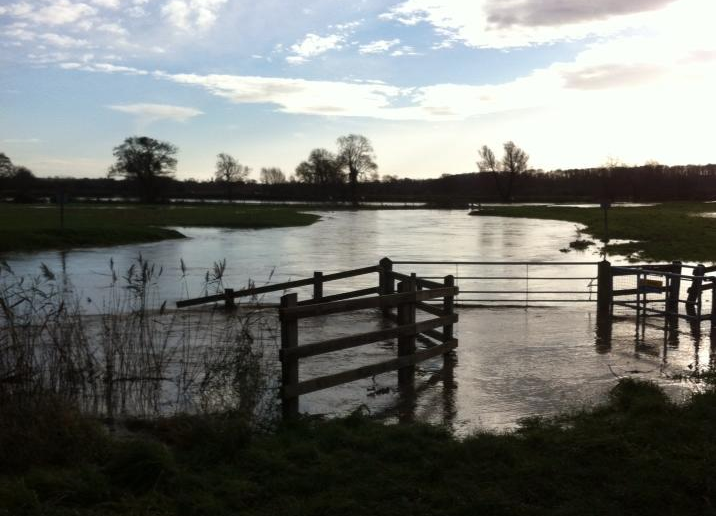 Traditionally winter flooding was sufficiently widespread that the county was abandoned during the summer months. The view over the gate below is normally grazing for a beef herd. But now, at last, the deluge subsides. Yesterday was a bright cold day with brilliant sun and we went hunting at Ashington Wood near Yeovilton. The sun shone all day and whilst it can’t have helped scenting conditions it gave cheer to the hounds because they worked hard all day. Today dawned frosty with an explosion of colours. Life can’t be bad when the embers of the morning sky burn through frosted crack willows to light the commute to work.